The United Nations has appointed Earth's ambassador should aliens touch down in the near future. Their selection? Malaysian astrophysicist Mazlan Othman, who heads the UN's Office for Outer Space Affairs. UPDATE: Boo! It was a hoax. During a talk Othman gave recently to fellow scientists, she said: "The continued search for extraterrestrial communication, by several entities, sustains the hope that some day humankind will receive signals from extraterrestrials [...] When we do, we should have in place a coordinated response that takes into account all the sensitivities related to the subject. The UN is a ready-made mechanism for such coordination." 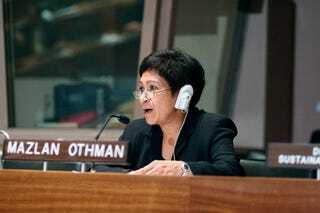 Professor Richard Crowther, an expert in space law and governance at the UK Space Agency and who leads British delegations to the UN on such matters, said: "Othman is absolutely the nearest thing we have to a ‘take me to your leader' person." Congratulations to Dr. Othman on representing the whole of the human race should aliens decide to park in our backyard. No pressure! Also, does this job come with a Ceremonial Flamethrower? It's the least you can do for the person who's responsible for keeping our species out of a Kanamit cookbook.